Just outside Pune, if you didn't need a cup of tea after an hour's drive on a dusty highway with only the smell of industries for company, you could miss Shirur completely. Narendra Modi visited the region on Saturday, but that's not the reason for the buzz. Shirur town is barely urban still, even locals refer to the area beyond the main market and state transport bus stand as their gaon. And they count among their biggest exports to the big city the manufacturer of a major gutka brand, a one-time Shirur local. The little tea stalls outside the ST bus stand are patronised by men mindless of the cement dust swirling around ceaselessly as bus after bus hurtles out of the depot. The men are somewhat animated today, there are people walking determinedly in one direction. The election mood is building up slowly. A man in a three-wheeler equipped with a loudspeaker is exhorting people in a monotonous drone to vote for the Shiv Sena's Shivaji Adhalrao Patil. Perhaps there is a small rally nearby and that explains the mild excitement in the air? Negative. A mela? An itinerant performer? Negative. A celebrity visitor? None. As it turns out, the tea-shop men are indeed discussing a visitor, or three. Three container trucks passing through the town were stopped by a squad of Election Commission officials on Friday. 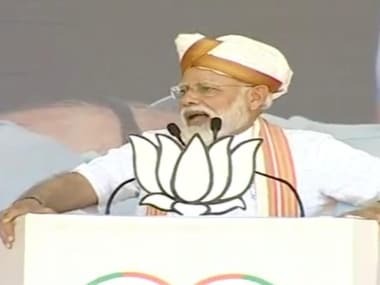 Plastered on the face of the containers, agaonst a background of saffron, was Narendra Modi's severe face and his prediction: "Acche din aane waale hain." Not very good days, though, for the three drivers of the container vehicles. Stopped by the squad, they reportedly had neither proof of any permission for campaigning, nor some other road documents. The trucks, belonging to a container vehicle operator in Surat, were reportedly headed for Raipur and Bijapur. The drivers were identified as Atul Singh Narayan Singh Bakshi Singh from Rae Bareilly, Satvan Kumar Patel from Allahabad and Manish Kumar Trivedi from Rae Bareilly. All three were hauled off to the local magistrate, offences slapped for violation of the Model Code of Conduct and then released on bail. No offence was registered against the Bharatiya Janata Party. 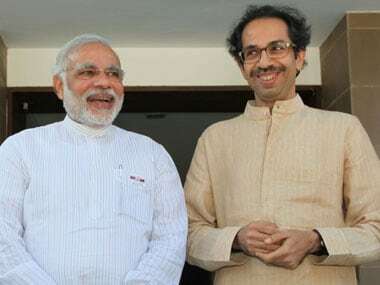 Shirur does not even have a BJP candidate -- the Sena's Shivaji Adhalrao Patil, a sitting MP and a former NCP man, is taking on a newbie from the NCP. 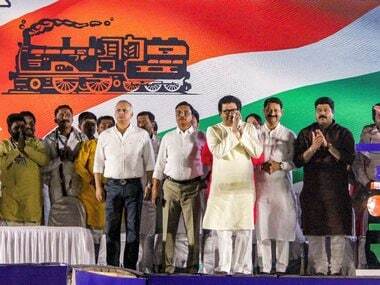 With five NCP MLAs in the Lok Sabha constituency, Adhalrao-Patil will have a tough fight ahead of him, say local NCP leaders. But with such Maharashtra heavyweights as Assembly Speaker Dilip Walse-Patil representing one of the Assembly segments that fall under Shirur LS constituency, it's more than a bit odd that the NCP has chosen to field a first-timer. In all probability, say locals, Adhalrao Patil will post a comfortable victory once again. Ho hum. Interestingly, the containers were not empty. 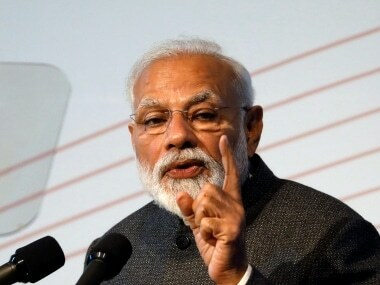 According to sources, they were carrying screen-and-projector equipment inside, probably ready to play the new Good-Times-Are-A-Coming anthem of the BJP. 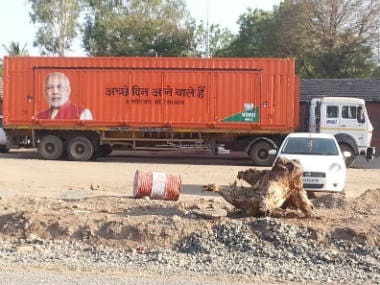 The bored locals of Shirur who rushed to gawk at three containers parked on a dust patch outside a government office, to be very honest, would have been rather happy to watch.